The ceremony is an ancient one that was originally religious in nature. Nowadays, the religious meanings are gone to the martial arts world, including the Kenryukan. Therefore, we ascribe absolutely no relation or relevance to religion. It appears to have been a celebration in preparation for a New Year, the people would clean and prepare their homes for another year. The ancient samurai would take their armor and weapons and polish them to shine as a mirror. The sword being the soul of Japan and the mirror the spirit, this would be an opportune time for the warriors to honor their weapons. Small round rice cakes would be offered to the spirits and the weapons prepared. Rice was considered the staple of life and, therefore, understandably held in high esteem and reverence. The special rice cakes mentioned above were made for this celebration. These cakes were called mochi and still are fashioned in the form of old style metal mirrors. Two to three would be placed upon each other with an orange on the top to represent the orchids. Sometimes, other ornaments would be placed about the mochi symbolizing various devotions. These rice cakes tended to become very hard and after a few days had to be broken with a hammer, hence the concept of breaking the mirror. The broken pieces would be eaten with other foods and the refreshing of one’s spirit begins. In modern times, the entire country celebrates New Year with a two-week celebration where schools are closed, businesses shut down and families gather together. Families would take this time to join with other family members and basically have a good time. Parents would play games with their children and a highly festive celebration of the New Year would begin. Sometime about the mid-1880’s, Jigano Kano originator of judo, re-invented the celebration of Kagami Birake. From that time on many traditional martial arts schools followed suit. As was mentioned before, this celebration has no religious meaning, but rather a spiritual one having personal significance. 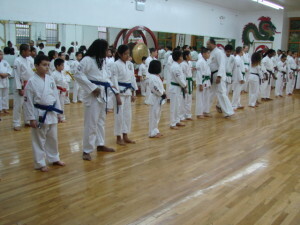 Usually, the formal celebration takes place on the second weekend of January and always in the home dojo. 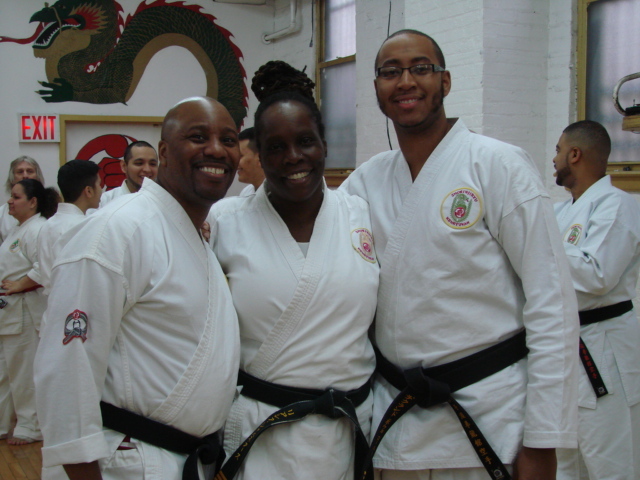 Many black belts from our dojos along with number of their students traveled to join the black belts and students at the Imperial Dragon Hombu Dojo. The temperature and weather conditions were highly favorable. Of course, the temperature in the dojo was rather high as students and parents (a number of whom wished to join in the ceremony) as the mirrors fogged over and the walls dripped with condensation. 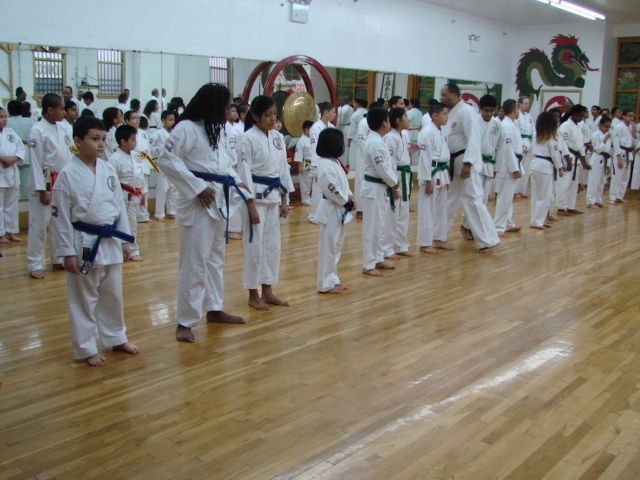 Due to distance concerns some of the Kenryukan dojos will celebrate in their specific dojo later this week. The Kenryukan splits the celebration into two parts. The first part, takes place on the last official day of classes for the year. Students review all kata taught during the year, inspirational speeches, and other very special aspects are held including a New Year’s kampai (with orange juice), cookie and small gifts. 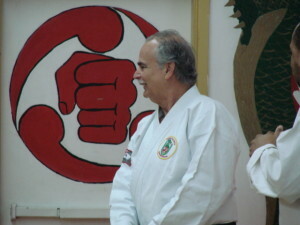 The second part, takes place usually on the first official weekend class. This is when all students engage in the most demanding and physically strenuous class of the year. 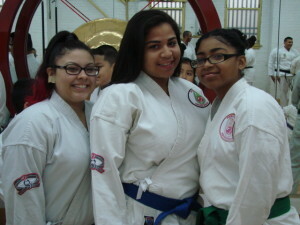 A class where students are pushed to the limits which they do not believe they can do, but they do. The class consists of each student doing 1,000 kicks, 1,100 punches, 1240 jumping jacks, 1,090 crunches and about 200 push-ups. 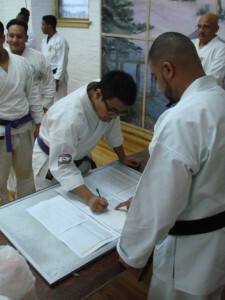 The students then line up and sign the special attendance sheet acknowledging their attendance and completion of their part of the ceremony. The chief instructor along with the other instructors address the students, a kampai (oj), and sweet cakes are distributed along with two special gifts to each participant. 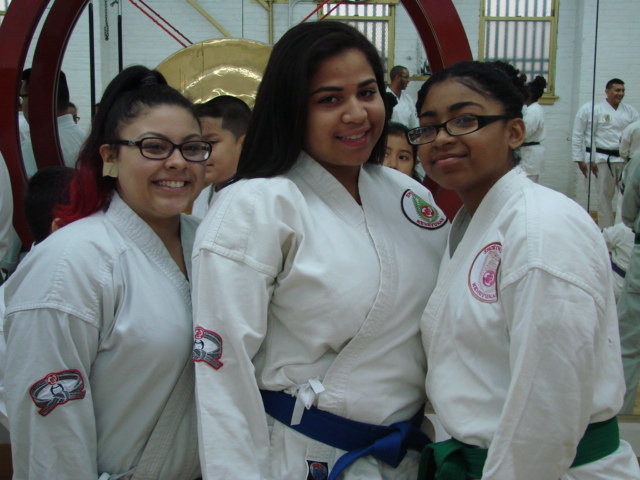 It is at this point, that the students have rededicated themselves to yet another year of learning and training. A special shout out to those Black Belt who participated Kyoshi Troy, Kyoshi Vincent, Shihan Big Al, Tashi Mark, Tashi Yesenia, Tashi LeAsia, Sensei Jason, Sensei Kevin, Sensei Henry, Nidan Marc, Nidan Joey, Nidan Eileen, Nidan Decland, Shodan Daniel and Shodan Vaquine for their Herculean support, dedication and friendship. We must give a special word of admiration to the brave and stout-hearted parents who participated. Congratulations to all. Now our training continues in earnest. We know that a lot of calves will certainly be mooing this morning. By the way, absentees are not exempt.